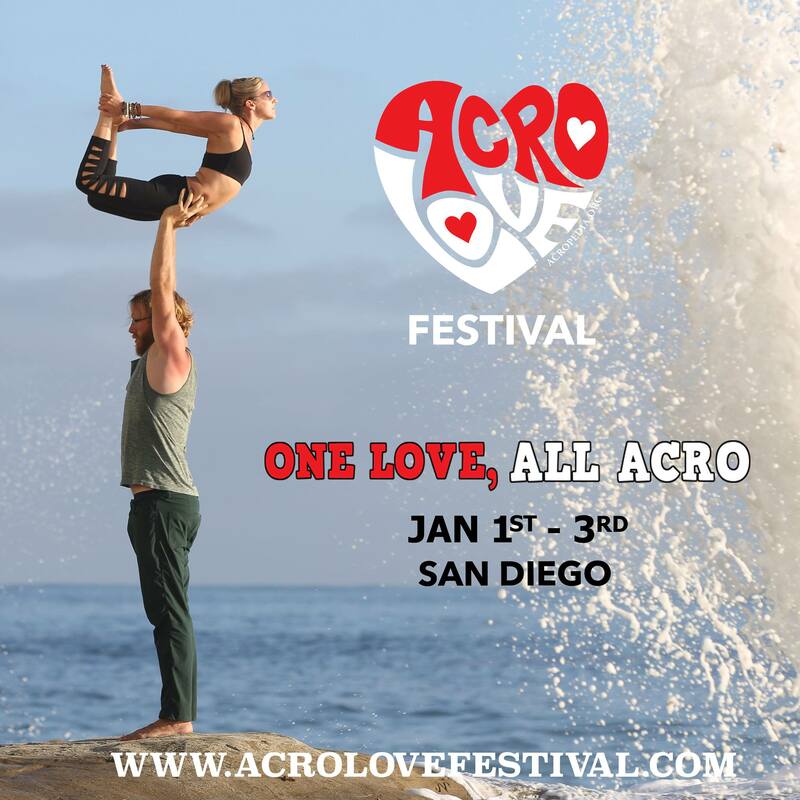 Really happy to share that Emily Reuman & I will be teaching our particular brand of progressive AcroYoga at the next AcroLove festival in San Diego over the New Year. Last time we had a great time, the students were so good and attentive, and the organizers of the event created such a wonderful vibe. Really looking forward to returning! Thanks to Lizzy Tomber, Adam Hiner, & Josh Young for having us back! Come share the AcroLove with all your acro super friends! One city, one weekend, one love! The weather will be amazing in San Diego in January. This festival will be taught by 50 teachers! Including Acro Superstars Josh Young, Lizzy Tomber, Adam Hiner, Jason Nemer, Duo Die Acrobatics, Jean-Luc Martin, Cheetah Platt, Chelsey Korus, Elizabeth Overton, Matt Fields-Johnson, Christine Moonbeam, Jonathan Rea, Leah Russell, Amy Impellizzeri, Aaron Lind, Jacob Brown, Britta Rael, Mara Harris, Rhiann Platt, Jackie Dragon, Rachel Dragonfly, Micki Mooney, Mateo J Daniel, Sariah Papaya, Jenna Hollow, Patrick Reiner, Kelly Thayer, André Newman, Serena Tang, Debbie Collis, Sara Laimon Luke, Whakapaingia David Luke, Flips Ohulahan, Max Lowenstein, Liz Kong, Danya Xena, Hobs Hobotus, Christopher Filkins, Emily Reuman, Fred Onetwothree, Jessalyn Leean Oxford, Nick Milan, Daniela Garza Ríos, and Ezra LeBank. In addition there will be a yoga class during every time slot with some amazing yoga teachers! Including Laura Kenny Kasperzak (Laura Sykora), Robin Bergman Martin, Chelsey Korus Yoga, Fallon Nicole Sharon Lev, Jano Galindo, Steve Hubbard, Jon Old-Rowe, and Koha Yoga. If you want to take your practice to the next level with a bunch of friends cheering you on, then come share the AcroLove with a badass crew of acrobats! All levels welcome. Come alone or bring friends. To sign up for the full festival. To sign up for the yoga pass only.